The South American fruit fly is an important pest because it likes a wide variety of fruit. It could make its home in our climate and attack some of our valuable fruit crops. This fruit fly is native to the Americas. It's found in South, Central, and part of North America. The fly has a number of different types. These different types may feed on different ranges of plants and live in different climates. Scientists are still working out whether some might be different species. Adult flies lay eggs into host fruit. 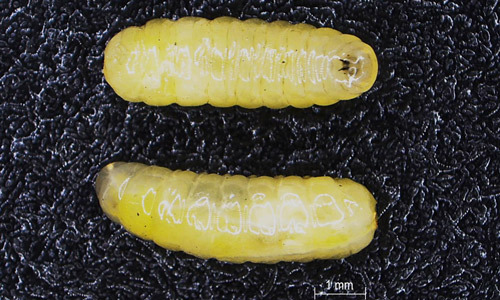 The young stages (maggots) feed inside the fruit, causing it to rot and become unmarketable. The South American fruit fly feeds on a wide range of hosts, including citrus, feijoa, guava, apples, stonefruit, mangoes, and grapes. It has even been found on kiwifruit. While it doesn't stop plants fruiting, it makes the fruit very unappealing. 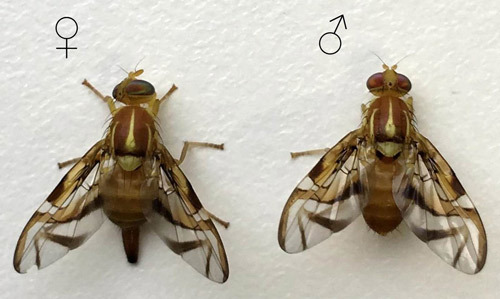 An infestation of South American fruit fly would cause control costs, production losses, and some countries might stop accepting our exported produce. South American fruit fly would be most likely to get to New Zealand in fruit infested with eggs or maggots. Biosecurity New Zealand has strict measures in place to limit the chances of the fly making it through the border. But we need you to be vigilant, too. Whenever travelling to New Zealand, always declare any food or fruit in your luggage. If you fail to do so, you could face a $400 fine. has a yellow to orange-brown body. The female fly has a pointed 'sting' up to 2mm long (the ovipositor) at the end of her body. This is used for laying her eggs in fruit.